The Heaphy track - guiding by default!! The Heaphy track runs through some of the oldest terrain geologically in New Zealand and retains much of the the Flora and Fauna that was present (read birds and Native forest which we call Bush) from before breakup of the great continent Gondwanaland over 100 million years ago. A chance meeting with an old friend a couple of years back has led to a job with local company "Bush and Beyond" working as a walking guide on the Heaphy , at 80 kms considered the longest and most diverse of the "Great Walks" in New Zealand. Often , when thinking of guiding, one thinks of load carrying, cooking, health and safety and perhaps a little knowledge about the track and a few off track trips but primarily its a people orientated job and after a couple of trips its mainly the people who keep it interesting. As I have discovered theirs also a "walk bagging" fraternity who travel the World over doing famous walks!! After a busy last 6 weeks walking thru bush the mind craves the more serene alpine world which at this moment I just get glimpse's of now and again in the distance!! A short run alone thru bush led to this opening revealing the vast Tasman wilderness area. The Tasman sea at the Heaphy river mouth. The Drunken sailor and the Dragons teeth. These are viewed from Perry saddle hut , about as close as one gets to mountains on the trip thru. 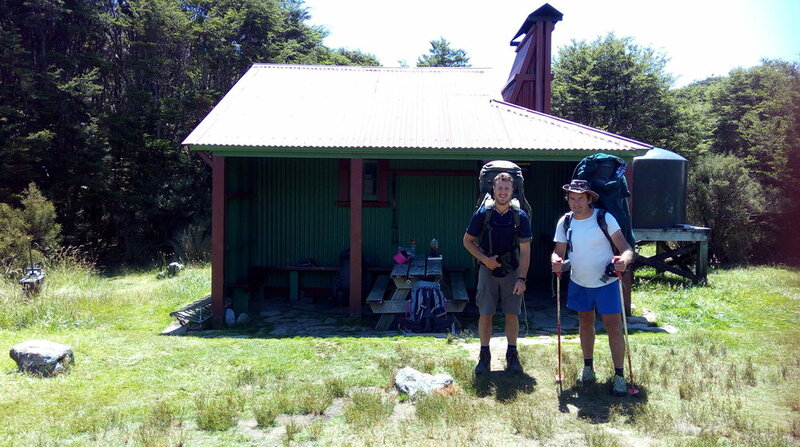 Whilst most of the huts are modern lodges , Gouland Downs hut remains a piece of history. The Gouland Downs looking back to the mountains. Newer PostGetting back into it!! Older Post2018 - Happy New Year and a final mountain jaunt.